Are you a Millennial? Are you so busy and important that you don’t have time to stop for even a few moments to eat food? Are you willing to fearlessly fill your body with trendy food replacements, the long-term effects of which are completely unknown? 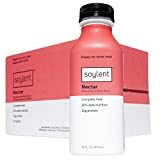 If you answered yes to all of those questions, today is your lucky day because Soylent just came out with two new flavors and they’re both on sale on Amazon — if you choose one of the Subscribe & Save options, you’ll get a 20% coupon to use with your first order. 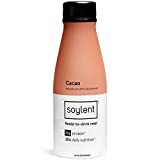 Soylent Ready To Drink Food in the new Cacao flavor is “made from real chocolate,” and the Soylent Ready To Drink Food in Nectar is “fruity and delicious.” Best of all, these are Soylent Drinks and not Soylent Bars, so you might not get “violently ill” from consuming them. Fingers crossed! Soylent Drink is a nutritionally complete, ready-to-drink meal in a bottle. Each 400 calorie bottle contains 20% of your daily nutritional requirements. Delicious Cacao flavor made from real chocolate. A perfect replacement for breakfast or lunch during those hectic days. Ingredients include isolated protein from soy, slow-burning carbs from beets, and all essential vitamins and minerals. Contains no animal products. Fruity and delicious Nectar flavor.